Last week, I found myself in Manila for an emergency meeting with some colleagues. These days, Manila trips are never complete without at least one visit to Fort Bonifacio, with the area always buzzing at night due to the allure of Serendra and High Street. While walking at Serendra after a long meeting with my account, a colleague and I went out on a search for an interesting restaurant that we have not tried yet. 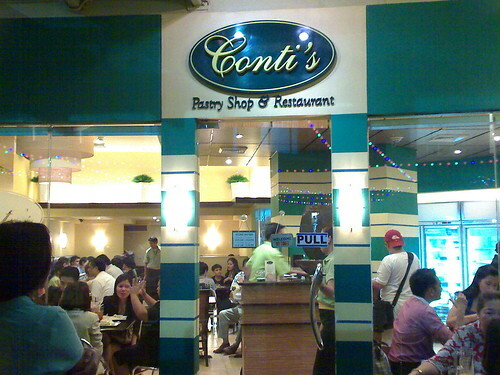 Our appetites were adventurous, and we decided to try out Conti's Pastry Shop and Restaurant. We were easily drawn to its inviting facade. When we went in, the ambiance was warm and friendly. The place was almost packed at 7pm on a Thursday night. Everyone was relaxed and busy chatting the night away with their companions. Each seemed to have an interesting story to tell. My colleague and I were seated at a table for two near the entrance. We first tried their bestseller salad, since everyone seemed to be ordering it. It was practically on all of the tables around us! It was indeed sumptuous. Sorry, I really missed the name. It's the salad featured on their menu as a must-try. Next, I had the Chicken Roulade with Saffron Mushroom Risotto. It's chicken with creamy cheese in the middle, and a bit of gravy sauce on top. It reminded me of my favorite Chicken ala Kiev at UP Diliman's Chocolate Kiss Cafe. My colleague ordered Fish and Chips with Salad and French Fries. The fries came with a honey mustard sauce. By the time we were eating our main course, I thought the experience at Conti's was nice but the one that took the cake (literally!) was their famous dessert, Mango Bravo. It was actually just recommended by the staff, and I'm glad I got to try it out. It's the best, BEST dessert that I've tasted so far. The mango was ripe, and the cream tasted very delicious since it wasn't overly sweet. The taste was just right that you can't help but take another serving. As I ate the frozen dessert, I discovered interesting surprise ingredients like cashew nuts and chocolate bits. 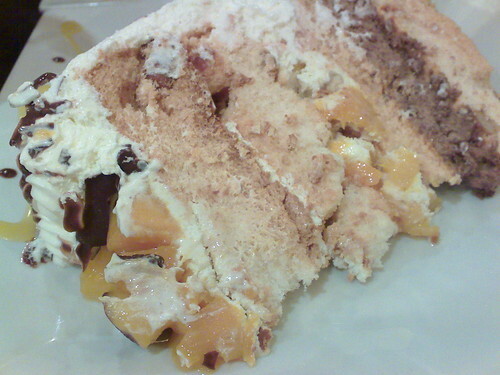 Mango Bravo was so good that one should dine at Conti's just to try this heavenly dessert. haha just got back from manila even. i'll text you guys next time when our schedule's not too hectic.